Last week, the Doctors’ Syndicate in Beirut decided to end its relationship with G4S, one of the world’s largest multinational security companies, following a campaign by activists in Lebanon concerned with the company’s ongoing complicity with Israeli violations of Palestinian human rights. The “Lebanese Campaign to Boycott the Supporters of Israel” has announced that the decision by the Syndicate to not renew its contracts with G4S is an important milestone in the global campaign against the company. The group noted that several other institutions, including the Arab Bank, UNICEF and the Dunes Complex, in the Verdun neighborhood of Beirut, have also distanced themselves from G4S over the past few months. The global campaign against G4S was launched in 2012, after a call by Palestinian political prisoners to boycott the company over its role at the time in providing equipment and services to Israeli prisons, where Palestinian political prisoners are routinely held without trial and subjected to torture and ill-treatment. 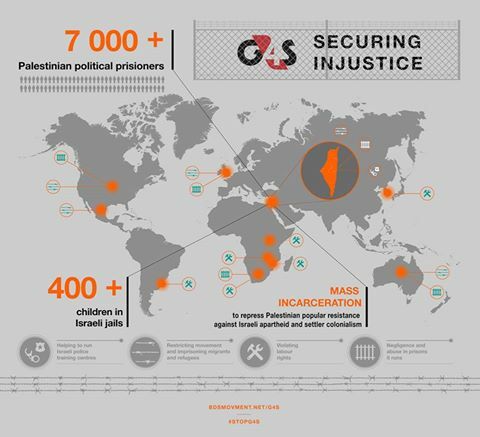 G4S has also been involved in servicing Israeli military checkpoints and illegal settlements built on stolen Palestinian land. Under strong pressure from BDS activists participating in the international Stop G4S campaign, G4S has, for the last several years, been losing major deals and investments around the world. In 2016, the company was forced to sell most of its business in Israel, but still services the Israeli Police Academy and invests in the Shikun & Binui group which builds illegal settlements. As such, G4S remains complicit in Israeli violations of Palestinian human rights, and will continue to be a BDS target due to its persisting complicity. The Palestinian Boycott, Divestment and Sanctions National Committee (BNC), the largest coalition in Palestinian civil society and the leadership of the global BDS movement, welcomed this victory and saluted the efforts of activists in Lebanon. The BNC further confirms that the campaign against G4S will continue, both regionally and globally, until G4S completely ends its complicity in Israel’s regime of apartheid, military occupation and settler-colonialism.